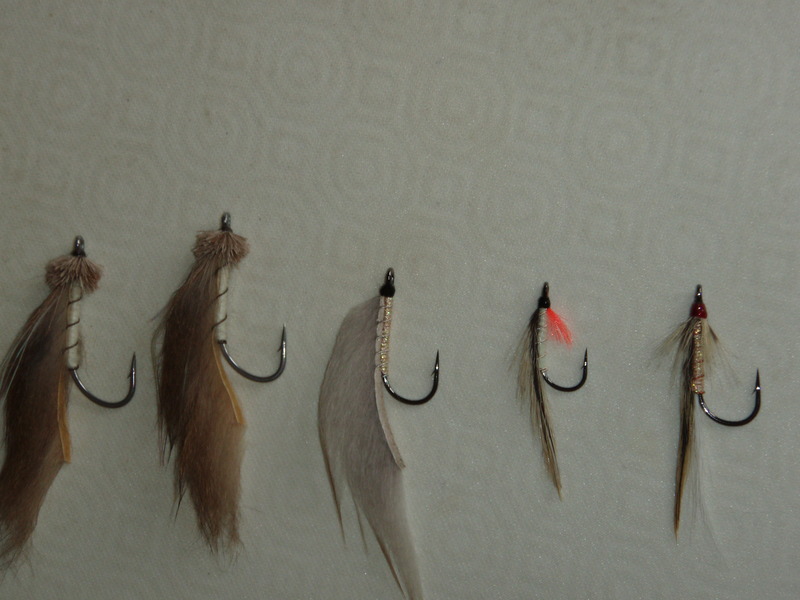 Soft plastics, or soft baits, were not readily available in New Zealand until the early 21st Century. Since then the growth in popularity of these lures has been phenomenal due to their success in catching a wide variety of fish species. I started using them in the late 1990’s when I imported some Sassy shads from the USA. They were an immediate success, especially on snapper, and consequently I was hooked. Soft bodied lures are normally either scented or unscented. They also can be fished to float or sink but to achieve the latter some weight will need to be used during rigging. Soft bodied lures are shaped to either move enticingly during the retrieve (paddle or curly tail) or remain fairly inert (stick or jerk shads). The angler must impart action when retrieving stick or jerk shads in order to make them appear lifelike. Soft plastic lures consist of a body, a hook and some form of weight. The body is either made of proprietary polymer blends (synthetic) or a combination of biodegradable gelling hydrocolloids, such as Gelatine, Alginate or Carrageenan (natural). Body texture is a critical factor in soft plastic lure effectiveness. The body must be rigid enough to hold its shape when being threaded onto the hook yet elastic enough to prevent fish from tearing it off the hook. The balance should be tipped slightly in favour of elasticity so as to allow the tail section to wiggle enticingly when retrieved through the water. Plasticisers and non-gelling hydrocolloids are added to the synthetic and natural body materials respectively to increase pliability. It is most common for the weight to be moulded around the hook as a jig head. 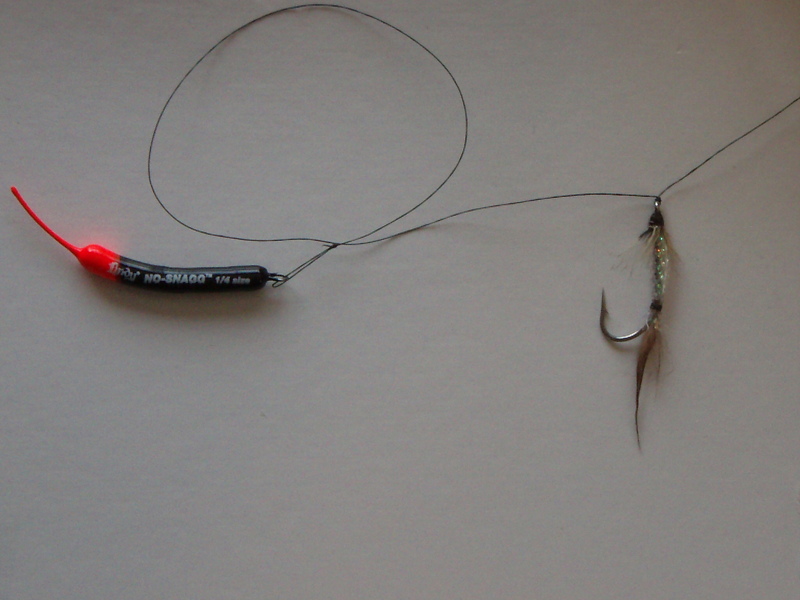 The jig head can be weighted with resin (see arrowed lure in photograph below) or with lead. Lead jig heads tend to be heavier and sink more quickly. Resin heads are very useful if you are fishing in an area that is fairly shallow with negligible current. I use them at dead low tide on the flats and carefully work them along the drop offs. 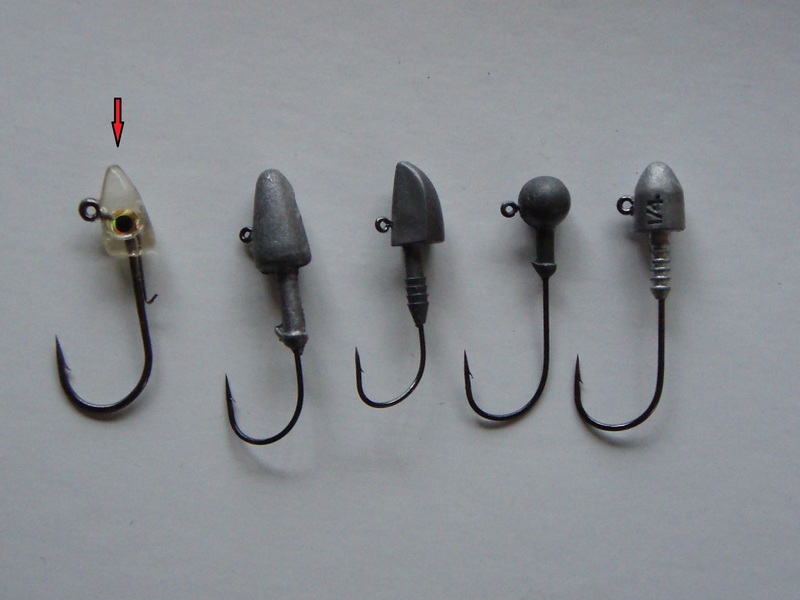 The shape of the jig head affects sink rate and how the lure tracks through the water. Broad angled heads dart on the up lift and flutter on the drop which makes them ideally suited for use with stick or shad baits having little action. Ball shaped jig heads track straight and are suited to paddle and curly tailed bodies with more tail movement. When fishing soft plastics from the shore it is essential that lure flutters down through the water column and sinks slowly to the bottom as is the case with an injured baitfish. It can be difficult to achieve this balance when there is current and it may often be necessary to adjust the jig head weight and profile regularly to account for variations in the speed of tidal flow. A rough rule of thumb is that the lure must reach the bottom by the time it has travelled a third of the way through the total drift. If the angler is casting upstream at an angle 45o then by the time the lure drifts downstream to be directly in front of the angler it should have reached the bottom. Soft plastic lures are often taken on the drop so the angler must keep in touch with the lure at all times. Care must also be taken not to impede the progress of the lure by keeping the line too tight. This is a skill that must learned through experience. If the angler does not feel any bites on the drop then it is likely that too much slack is being provided. There are several other ways to rig weighted soft plastics aside from using jig heads. The two most common are the Carolina rig and the Texas rig. 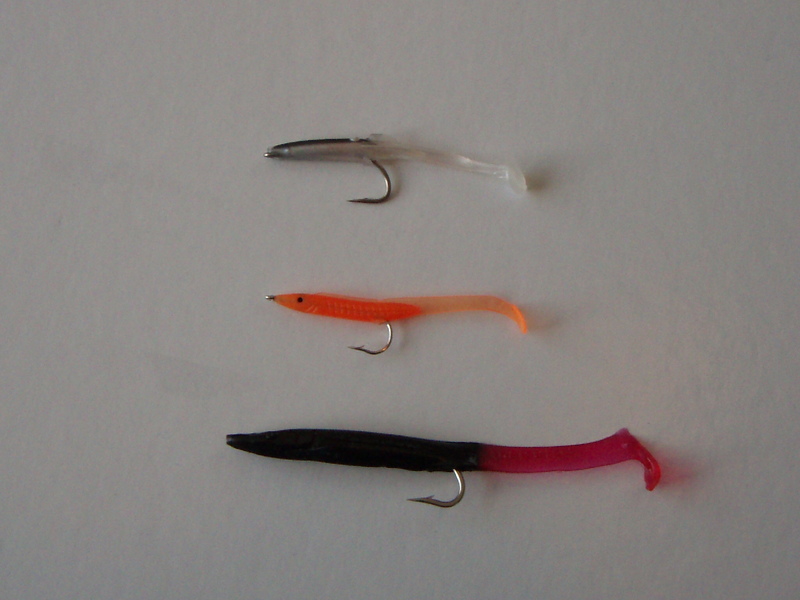 These rigs are most often used for soft plastic lures threaded onto worm hooks. 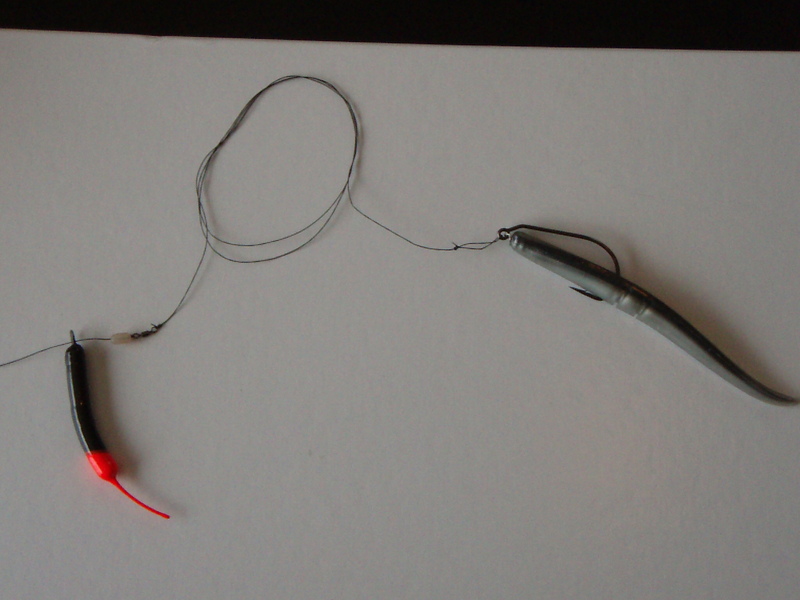 In a Carolina rig (photograph above) an unweighted, rigged soft bait is tied to a trace which is in turn connected to the mainline via swivel. A weight is placed above the swivel and this carries the rig down to the bottom. It is most common for the weight to be a ball sinker but the photograph shows a No-Snagg sinker which as its name implies is designed to bounce across the bottom and not snag. Note that the trace is looped in the photograph to ensure that the entire rig could be shown. In a Texas rig, an unweighted rigged soft bait is tied directly onto the mainline immediately after the mainline is threaded through a bullet or ball sinker. The pointed end of the bullet sinker faces away from the lure to make the entire rig more streamlined. The weight is often held in place with a toothpick to stop it sliding up the trace as the lure descends through the water column. The final way to rig an unweighted soft plastic (or fly) is to attach it via a Palomar knot directly on to the mainline above a sinker. For simplicity, this will be referred to as a ledger rig. This is shown in the photograph below. Once again a No-Snagg sinker is shown as it is much less likely to get caught on the bottom as the lure drifts downstream with the current. Flies can be fished with a spinning rod using the Carolina, Texas and ledger rig (as described above – where the fly is attached to the mainline via Palomar knot above a weight). There is another class of soft plastic lure, common in the UK and starting now to appear in NZ, which can also be fished the same way as flies. These lures are generically known as rubber sandeels and include brands such as Eddystone Eels, Deltas, “Jelly beans” and Redgills. Rubber sandeels have a slim baitfish profile and a thin paddle tail that wiggles seductively with very little movement. Rigged rubber sandeels are cast directly out from the angler and allowed to drift in an arc on a tight line (as per a wet fly retrieve) until they reach the margins where they are retrieved in an erratic lift, pause fashion. Retrieved in this way they are deadly on Snapper, Kahawai and Trevally. It is possible to get these lures pre-threaded onto a jig hook and weighted. This makes them ride with the hook point up which prevents snagging. Reputable lure manufacturers invest large sums of money in Research & Development and are driven to produce lures that will catch fish. If their lures do not catch fish then they will quickly go out of business. Sophisticated advertising and marketing campaigns are developed to convince anglers to purchase the latest lure offerings however if the lure does not perform then the angler will not re-purchase the lure. In short, it is likely that all of the lures offered by these manufacturers will catch fish provided they are used correctly. Often it just takes a lot of experimentation to find the optimum retrieve (“sweet spot”). It is in teaching anglers how to use each new lure where lure manufacturers often sell themselves short. Very few lure packets contain descriptions on how to use the lure correctly or details on types of retrieves (especially speed) that are most likely to lead to success. Manufacturers owe it to themselves to provide as much point of sale information on the lures as possible as nothing will guarantee repeat sales faster than angler success. This information must be available from the R&D process undertaken to develop the lure. It is a mystery why this detail is not included on the lure packet.